A wonderful trio of antique painted metal deed boxes. 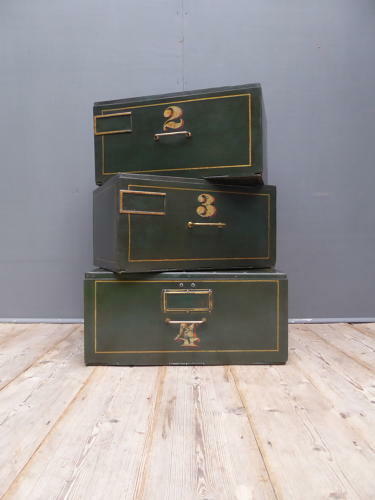 Three meatal deed boxes, numbered two to four & finished with coachlined detailing & brass handles. Likely once part of a larger run & formerly used by a solicitors firm, the sign writing on these deed boxes is absolutely fantastic, they have a stunning depth of colour & display beautifully. Wear commensurate with age, very good solid condition. Unrestored with one door a little stiff but all functional. Two boxes measure 39cm x 27cm x 20cm & one is slightly larger at 43cm x 30cm x 20cm.